If you trust a climate scientist you are more likely to be a liberal Democrat. And, if you tend to be highly skeptical of climate science, scientific consensus, climate change causes, and even ways to address climate change, then you’re more likely to be a Republican. A fascinating study from the Pew Research Center sheds more light on the great, polarized divide between the left and the right. For instance, 70 percent of liberal Democrats “trust climate scientists’ a lot to give full and accurate information about the causes of climate change, compared with just 15% of conservative Republicans.” Further, just over half (54 percent) of liberal Democrats “say climate scientists’ understand the causes of climate change very well”, which compares with only 11 percent of conservative Republicans. Political fissures on climate issues extend far beyond beliefs about whether climate change is occurring and whether humans are playing a role, according to a new, in-depth survey by Pew Research Center. These divisions reach across every dimension of the climate debate, down to people’s basic trust in the motivations that drive climate scientists to conduct their research. Specifically, the survey finds wide political divides in views of the potential for devastation to the Earth’s ecosystems and what might be done to address any climate impacts. There are also major divides in the way partisans interpret the current scientific discussion over climate, with the political left and right having vastly divergent perceptions of modern scientific consensus, differing levels of trust in the information they get from professional researchers, and different views as to whether it is the quest for knowledge or the quest for professional advancement that drives climate scientists in their work. This survey extensively explores how peoples’ divergent views over climate issues tie with people’s views about climate scientists and their work. Democrats are especially likely to see scientists and their research in a positive light. Republicans are considerably more skeptical of climate scientists’ information, understanding and research findings on climate matters. 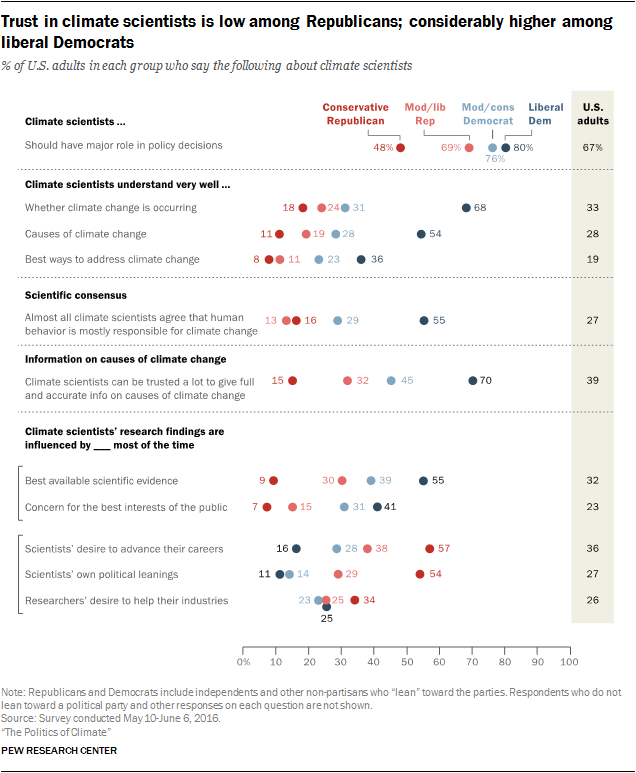 Infographic: Trust in climate science is low among Republicans; considerably higher among liberal Democrats. Courtesy: Pew Research Center. 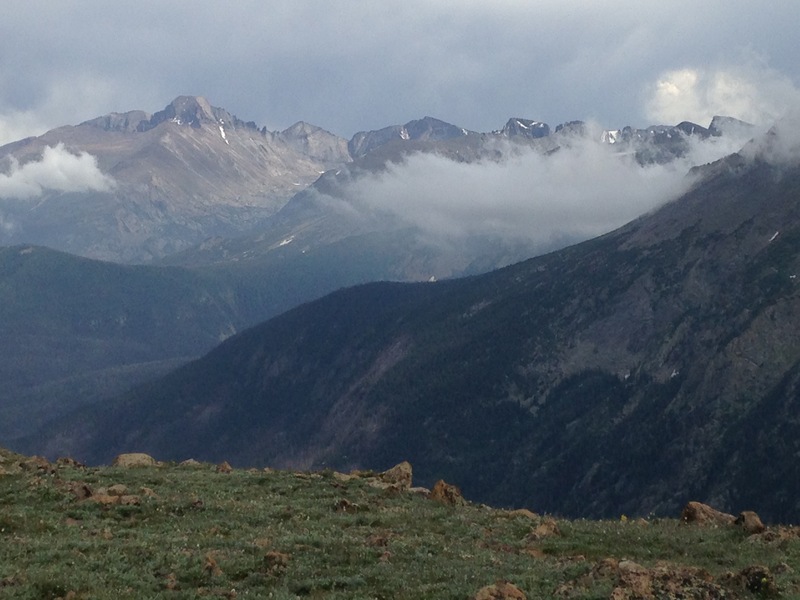 About 25 miles from where I write lies Colorado’s Rocky Mountain National Park (RMNP). It’s a gorgeous part of the world — pristine forests, blue alpine lakes, frigid streams and ragged peaks. Luckily thanks to the persistent work of Enos Mills and President Woodrow Wilson’s signature RMNP has been protected from development and destruction since 1915. So too are its 411 sister regions and monuments that now make up the US National Park System. The nationwide park system was officially founded 100 years ago today, August 25, 1916. It is a precious and priceless jewel — truly one of America’s best ideas. On this centenary we should be reminded that each one of our parks and monuments requires our constant and vigilant protection. We must do all that we can to ensure that our children and their children can experience for themselves — over the next 100 years (and beyond) — some of nature’s true wonders. Though keep in mind that while our parks may be protected from direct human exploitation they’re not immune to the ravages of climate change. As the National Parks Service (NPS) has charted the loss of glaciers, sea level rise and increase in wildfires spurred by rising temperatures in recent years, the scale of the threat to US heritage across the 412 national parks and monuments has become starkly apparent. As the National Parks Service turns 100 this week, their efforts to chart and stem the threat to the country’s history faces a daunting task. America’s grand symbols and painstakingly preserved archaeological sites are at risk of being winnowed away by the crashing waves, wildfires and erosion triggered by warming temperatures. The Statue of Liberty is at “high exposure” risk from increasingly punishing storms. A national monument dedicated to abolitionist Harriet Tubman, who will be enshrined on a new $20 note, could be eaten away by rising tides in Maryland. 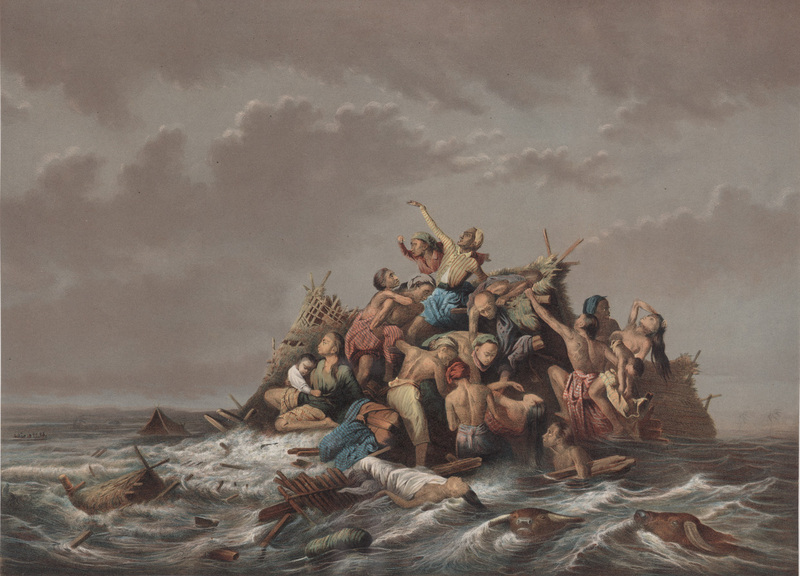 The land once walked by Pocahontas and Captain John Smith in Jamestown, the first English settlement in the US, is surrounded by waters rising at twice the global average and may be beyond rescue. These threats are the latest in a pile of identified calamities to befall national parks and monuments due to climate change. Receding ice, extreme heat and acidifying oceans are morphing America’s landscapes and coasts at a faster pace than at any time in human history. “Yosemite’s famous glacier, once a mile wide, is almost gone,” fretted Barack Obama during a visit to the vast park in June. “Rising temperatures could mean no more glaciers in Glacier national park, no more Joshua trees in Joshua Tree national park. Change, however, is inevitable no matter how quickly greenhouse gas emissions are cut. An NPS study from 2014 found four in five of America’s national parks are now at the “extreme end” of temperature variables charted since 1901. Image: Above the clouds, near the famed Trail Ridge Road, Rocky Mountain National Park, Summer 2016. Courtesy: the author. 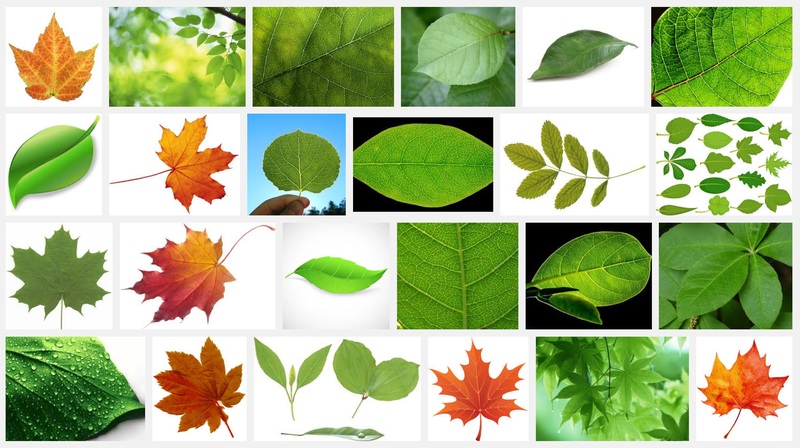 Researchers from the University of Illinois at Chicago have constructed an artificial leaf that captures sunlight and uses it to convert carbon dioxide in the atmosphere to usable hydrocarbon fuel. Senior author on the study, Amin Salehi-Khojin assistant professor of mechanical and industrial engineering, notes that “the new solar cell is not photovoltaic — it’s photosynthetic.” Using a combination of intricately engineered nano-membranes and unique combinations of catalytic molecules the artificial leaf takes in sunlight and CO2 and produces syngas or synthetic gas (hydrogen and carbon monoxide gas) from the cathode, and free oxygen and hydrogen ions at the anode. This is a remarkable breakthrough that holds real promise — not only producing energy in a sustainable way from renewable sources but also removing carbon dioxide from the atmosphere. Read more about this pioneering work here. Severe weather often leads to human tragedy, and of course our crops, pets and property suffer too, as well as untold damage to numerous ecosystems. But whenever I see or read about a weather-induced catastrophe — local flooding or a super-typhoon halfway around the world — one thought always comes to mind: what kind of weather will my children face as long-term climate change takes hold. Climate science offers continued predictions of doom and gloom: rising ocean levels, disappearing glaciers, stronger storms, longer droughts, more extreme weather. But climate science also tells us that long-term climate change will make for generally less predictable weather. Our present day meteorologists armed with powerful computational climate models have become rather good at forecasting weather on local and global levels. Generally, we have a reasonably good idea of what our local weather will be tomorrow or next week or next month. But a warming and changing climate adds much more uncertainty. William B. Gail, founder of the Global Weather Corporation and past president of the American Meteorological Society, cautions: there is a growing likelihood of increased unpredictability of our weather systems. Indeed, he predicts a new dark age, where climate change destroys our current understanding of weather patterns and undermines all our current, predictive weather models and forecasts. This is a huge problem for those of us who depend on accurate weather analytics for our livelihoods, especially farmers, fishing industries, aviation, ground transportation, and construction. Imagine a future in which humanity’s accumulated wisdom about Earth — our vast experience with weather trends, fish spawning and migration patterns, plant pollination and much more — turns increasingly obsolete. As each decade passes, knowledge of Earth’s past becomes progressively less effective as a guide to the future. Civilization enters a dark age in its practical understanding of our planet. To comprehend how this could occur, picture yourself in our grandchildren’s time, a century hence. Significant global warming has occurred, as scientists predicted. Nature’s longstanding, repeatable patterns — relied on for millenniums by humanity to plan everything from infrastructure to agriculture — are no longer so reliable. Cycles that have been largely unwavering during modern human history are disrupted by substantial changes in temperature and precipitation. As Earth’s warming stabilizes, new patterns begin to appear. At first, they are confusing and hard to identify. Scientists note similarities to Earth’s emergence from the last ice age. These new patterns need many years — sometimes decades or more — to reveal themselves fully, even when monitored with our sophisticated observing systems. Until then, farmers will struggle to reliably predict new seasonal patterns and regularly plant the wrong crops. Early signs of major drought will go unrecognized, so costly irrigation will be built in the wrong places. Disruptive societal impacts will be widespread. Such a dark age is a growing possibility. In a recent report, the National Academies of Sciences, Engineering and Medicine concluded that human-caused global warming was already altering patterns of some extreme weather events. But the report did not address the broader implication — that disrupting nature’s patterns could extend well beyond extreme weather, with far more pervasive impacts. Our foundation of Earth knowledge, largely derived from historically observed patterns, has been central to society’s progress. Early cultures kept track of nature’s ebb and flow, passing improved knowledge about hunting and agriculture to each new generation. Science has accelerated this learning process through advanced observation methods and pattern discovery techniques. These allow us to anticipate the future with a consistency unimaginable to our ancestors. But as Earth warms, our historical understanding will turn obsolete faster than we can replace it with new knowledge. Some patterns will change significantly; others will be largely unaffected, though it will be difficult to say what will change, by how much, and when. The list of possible disruptions is long and alarming. We could see changes to the prevalence of crop and human pests, like locust plagues set off by drought conditions; forest fire frequency; the dynamics of the predator-prey food chain; the identification and productivity of reliably arable land, and the predictability of agriculture output. Image: Image pair of Muir Glacier and melt, Alaska. Left photo taken in 1882, by G.D. Hazard; Right photo taken in 2005 by Bruce F. Molnia. Courtesy: Glacier Photograph Collection, National Snow and Ice Data Center/World Data Center for Glaciology. NASA. Eventually science and reason does prevail. But, in the case of climate change, our global response is fast becoming irrelevant. New research shows accelerating polar ice melt, accelerating global warming and an acceleration in mean sea-level rise. James Hansen and colleagues paint a much more dire picture than previously expected. The current rate of global warming could raise sea levels by “several meters” over the coming century, rendering most of the world’s coastal cities uninhabitable and helping unleash devastating storms, according to a paper published by James Hansen, the former Nasa scientist who is considered the father of modern climate change awareness. The research, published in Atmospheric Chemistry and Physics, references past climatic conditions, recent observations and future models to warn the melting of the Antarctic and Greenland ice sheets will contribute to a far worse sea level increase than previously thought. Without a sharp reduction in greenhouse gas emissions, the global sea level is likely to increase “several meters over a timescale of 50 to 150 years”, the paper states, warning that the Earth’s oceans were six to nine meters higher during the Eemian period – an interglacial phase about 120,000 years ago that was less than 1C warmer than it is today. Global warming of 2C above pre-industrial times – the world is already halfway to this mark – would be “dangerous” and risk submerging cities, the paper said. A separate study, released in February, warned that New York, London, Rio de Janeiro and Shanghai will be among the cities at risk from flooding by 2100. Hansen’s research, written with 18 international colleagues, warns that humanity would not be able to properly adapt to such changes, although the paper concedes its conclusions “differ fundamentally from existing climate change assessments”. The IPCC has predicted a sea level rise of up to one meter by 2100, if emissions are not constrained. Hansen, and other scientists, have argued the UN body’s assessment is too conservative as it doesn’t factor in the potential disintegration of the polar ice sheets. Hansen’s latest work has proved controversial because it was initially published in draft form last July without undergoing a peer review process. Some scientists have questioned the assumptions made by Hansen and the soaring rate of sea level rise envisioned by his research, which has now been peer-reviewed and published. Michael Mann, a prominent climate scientist at Pennsylvania State University, said the revised paper still has the same issues that initially “caused me concern”. “Namely, the projected amounts of meltwater seem … large, and the ocean component of their model doesn’t resolve key wind-driven current systems (e.g. the Gulf Stream) which help transport heat poleward,” Mann said in an email to the Guardian. Image: A Flood on Java (c.1865-1876) by Raden Saleh, lithograph. Courtesy: Royal Netherlands Institute of Southeast Asian and the Caribbean Studies. Public Domain. Video: Ice Melt, Sea Level Rise and Superstorms Video Abstract. Courtesy: Climate Science, Awareness and Solutions. How better to mark this year’s Earth Day than to remind ourselves of the existential perils of climate change. 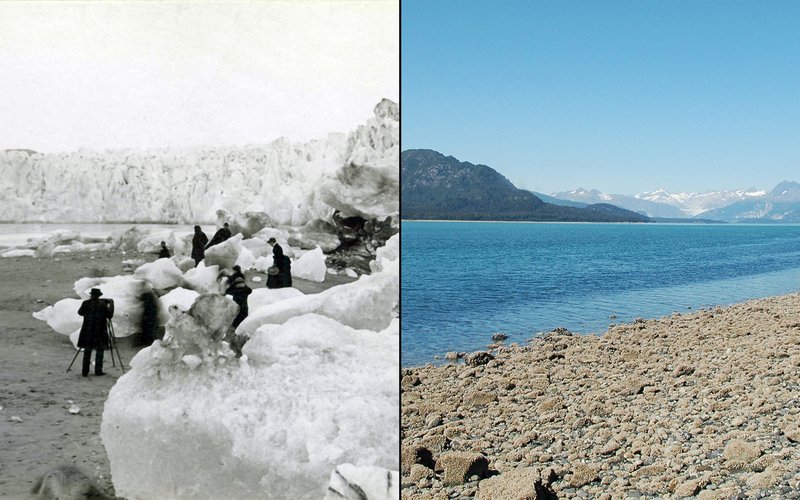 As the Earth warms, polar ice melts, sea-levels rise. As sea-levels rise, low lying coastal lands submerge. Much of coastal Florida would disappear under a sea-level rise of a mere 6 feet. Our tech innovation hub in Silicon Valley wouldn’t fare well either. Many of our tech giants, including Google, Facebook, Oracle, Cisco and Salesforce, have planted their roots on the bay-side of Silicon Valley. Much of this area is only a handful of feet above sea-level. Oh, and kiss goodbye to San Francisco International Airport as well — though perhaps the local VCs could re-purpose it into a sea-plane terminal. The map above, courtesy of National Oceanic and Atmospheric Administration (NOAA), highlights the flood prone areas in shades of blue. Technology giants including Facebook and Google face the prospect of their prestigious Silicon Valley headquarters becoming swamped by water as rising sea levels threaten to submerge much of the property development boom gripping San Francisco and the Bay Area. Sea level forecasts by a coalition of scientists show that the Silicon Valley bases for Facebook, Google and Cisco are at risk of being cut off or even flooded, even under optimistic scenarios where rapid cuts in greenhouse gas emissions avoid the most severe sea level increases. Without significant adaptation, Facebook’s new campus appears most at risk. The 430,000 sq ft complex – topped with a nine-acre garden rooftop – is an extension of its Menlo Park base and was crafted by architect Frank Gehry. Located near the San Francisco Bay shoreline, the offices are designed to house 2,800 staff. “Facebook is very vulnerable,” said Lindy Lowe, a senior planner at California’s Bay Conservation and Development Commission. “They built on a very low site – I don’t know why they chose to build there. Facebook thinks they can pay enough to protect themselves. Facebook has elevated its office to spare it from flooding, but even with a 1.6ft rise in sea levels by the end of the century – which is towards the lower end of projections – the area around it will be inundated. Much sooner, within the coming decades, the roads leading into the complex will flood so regularly that major adaptions will be required to keep the site viable. Facebook didn’t respond to repeated requests to comment on the issue. The situation is a little better for Google, located in Mountain View and also unwilling to discuss sea level rise, and Cisco, headquartered in San Jose. 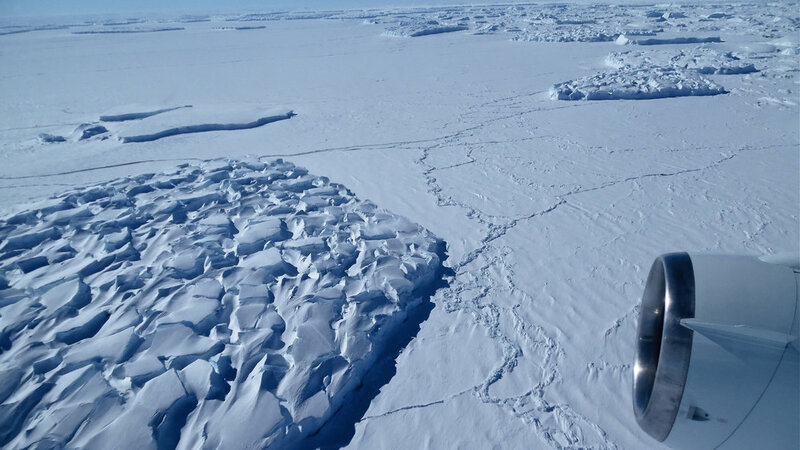 But should the Antarctic ice sheet disintegrate, as outlined in a recent scientific paper, seas will be pushed up beyond 6ft and swamp both businesses. The situation is similarly stark for Salesforce, which would see its San Francisco base submerged under the worst sea level rise scenario. Meanwhile, Airbnb, located near the vulnerable Mission Bay area, will have its headquarters gain a much closer bayside view simply by staying put. Read the entire store here. Image: Sea-level rise and coastal flooding impacts, San Francisco / Bay Area map. Courtesy of NOAA. The media loves to prank us with a good April Fools’ joke each year. This one is a gem — human-driven climate change will melt our glaciers and polar ice at an increasingly faster pace than previously calculated. Result: faster rising oceans leading to higher ocean levels. What a great joke! And, to quote the Republican front-runner for the presidential nomination, “I think our biggest form of climate change we should worry about is nuclear weapons.” Or, was it “a hoax created by the Chinese“? Care to follow more of this global joke? Check out this peer reviewed paper. Image: Icebergs that have broken from the calving side of Thwaites Glacier in Antarctica, November 2014. Courtesy Jim Yungel/NASA. Our planet continues to warm as climate change relentlessly marches on. These two images of Lake Poopó in the high Bolivian Andes over a period of three years shows the stark reality. The first image was taken in 2013 the second a mere three years later, in 2016. The images are courtesy of the NASA Earth Observatory acquired by the Operational Land Imager (OLI) on the Landsat 8 satellite. 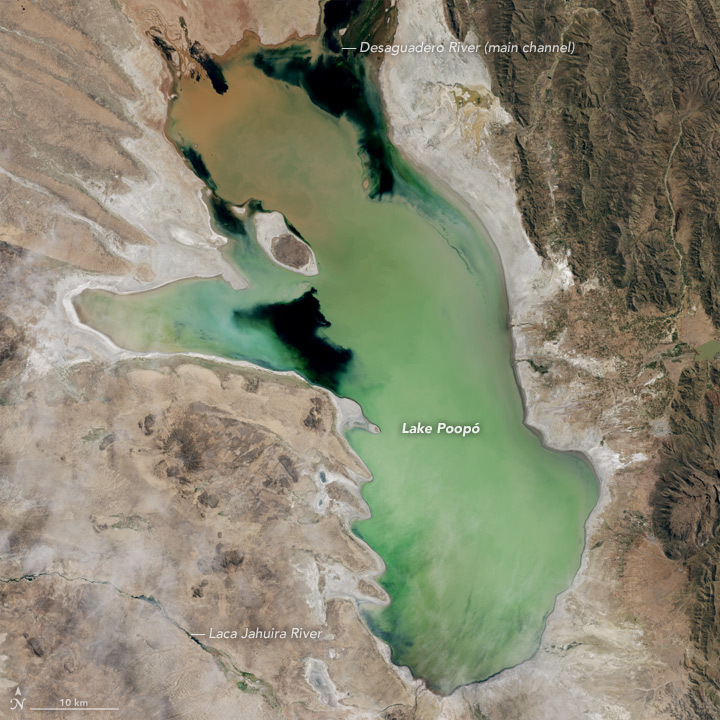 Most climatologists suggest that the lake will not return. Read more about the causes and environmental and human consequences here. 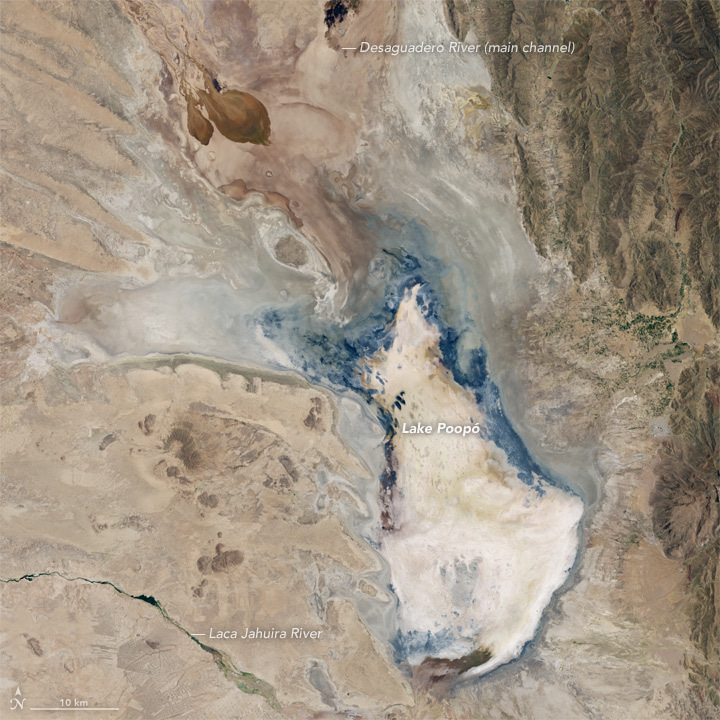 Images: NASA Earth Observatory images by Jesse Allen, using Landsat data from the U.S. Geological Survey. Caption by Kathryn Hansen.